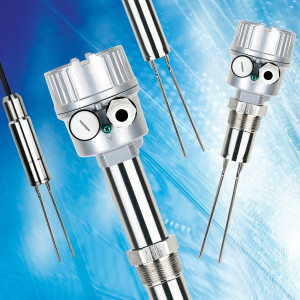 The SC35 Series is a vibrating fork point level sensor or tuning fork level switch, specifically designed to detect the presence and absence of a broad range of powder and bulk solid materials, including settled solids in an aqueous liquid. It is ideal for materials with density from 0.624lbs/cubic-foot (10g/l) and up. The SC35 series is a vibrating fork point level sensor that is ideal for powder and bulk solids with bulk densities from 0.624lbs/cubic-foot (10g/l) and up. The SC35 series vibrating fork point level sensor utilizes piezoelectric crystal and solid state electronics technologies to produce vibration in the tuning fork element at a specific frequency and receive electronic feedback. When the probe element is covered or in contact with the target material the vibration is dampened, the electronic feedback changes and presence of the material is thereby sensed by the electronics, which changes the state of the sensor output to indicate material presence. When the probe element is again free of the target material the vibration again is produced, the output state reverts to indicate material absence. Process temperature of -40⁰F~302⁰F (-40⁰C~150⁰C), 536⁰F (280⁰C) high temperature max. 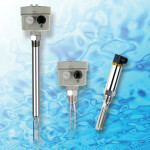 The SC Series tuning fork liquid level switch does not require any calibration, is easy to install and will operate properly as a high, low or intermediate level switch with a wider range of fluids. A “sister” product line, the SC35 series vibrating fork level switch for powder and bulk solids, the SC series tuning fork liquid level switch has the same high reliability and performance. 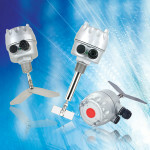 The FC/FD Series is a mini magnetic float level switch product line that is very cost-effective and compact. 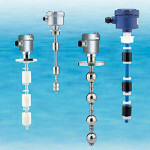 As such these magnetic float level switch units are easily installed on small machinery and in areas where very little space is available inside/outside the vessel in which they are installed. The SRP series rotary paddle point level sensor is the only bin level indicator at its price point available with state-of-the-art features. 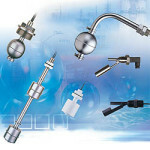 This level switch works with virtually any powder or bulk solid material.